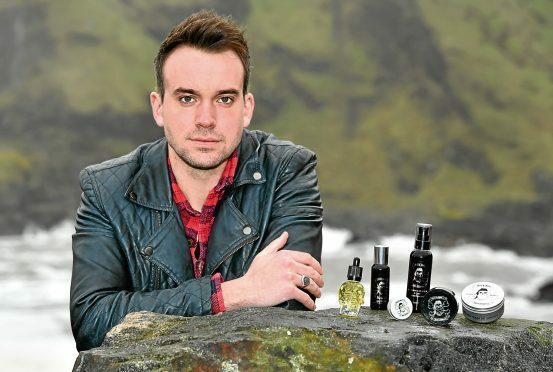 He only launched his business, Skull and Bone, from his home in Cove, Aberdeen, in October. But he has already sold more than 300 bottles of luxury eau de toilette, and interest in his products for hair styling, beard care and skin care is growing fast. Mr McGowan, 27, who has spent much of his career to date doing golf-related work, started out supplying a few friends with beard oil. It all took off from there and within months his new men’s grooming brand was a sponsor at the 2017 Scottish Hair and Beauty Awards (Shaba) in Glasgow, where its creator joined hundreds of people from across the industry in Scotland. Denise Van Outen and Calum Best were among the celebrity guests. Skull and Bone also recently featured in a leading barber trade magazine. Mr McGowan said: “The brand has had fantastic success in the first few months of trading. To be a sponsor for Shaba was a huge milestone for me and to showcase the brand in front of the industries finest was an honour. Most of his sales take place online but the products are also appearing in a growing number of north-east barber shops. The range, which includes moustache wax, hair dust and exfoliants body wash, has been given a “manly” image in a deliberate attempt to make it more masculine. Much of the market is “too girly”, Mr McGowan said, while adding: “Most men would probably admit to using their wives’ body washes in the shower if there is nothing else around. In a booming but “heavily concentrated” market, he aims to build sales on the back of a “more local” brand with strong green credentials. The products are manufactured for him in England, using natural ingredients.